I ordered an extra dozen eggs this week. I’ve decided that egg custard makes an eggscellent start to the day. I’ve already made one batch. It’ll be gone by the weekend and then I’ll make another. Wish I’d gotten duck eggs now. I got chicken eggs because they were cheaper, but duck eggs have richer yolks, which make richer custard. They also have five times as much vitamin B12 as chicken eggs. 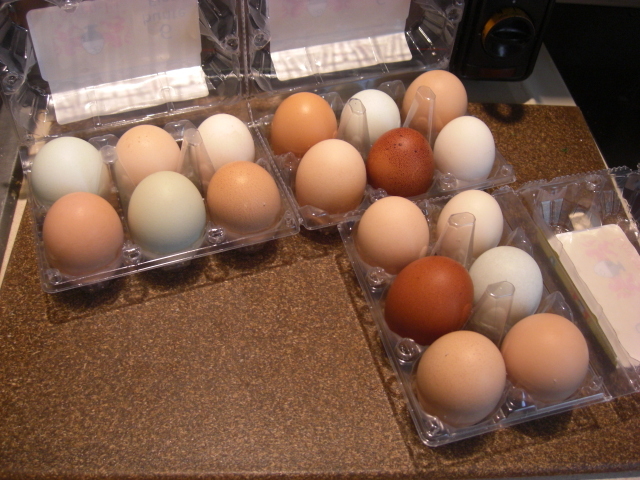 I’ve gone ahead and placed my order for a dozen duck eggs next week. Notice anything different about this lettuce? 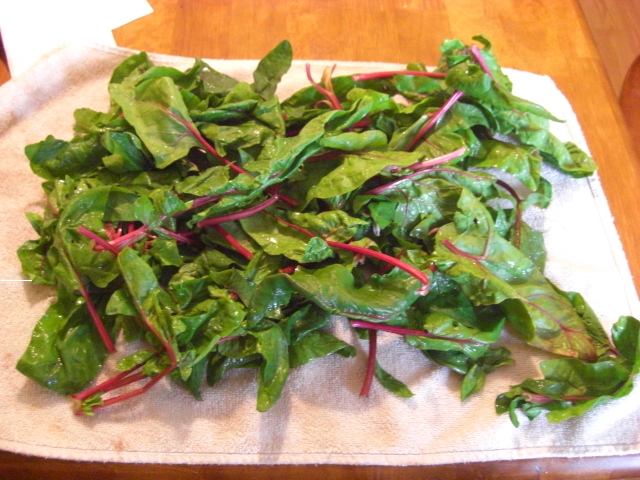 It’s not hydroponic – it actually came from the ground! If you’re like me, you’ve gotten used to the cover girl looks of the hydroponic lettuce we’ve been getting this spring. 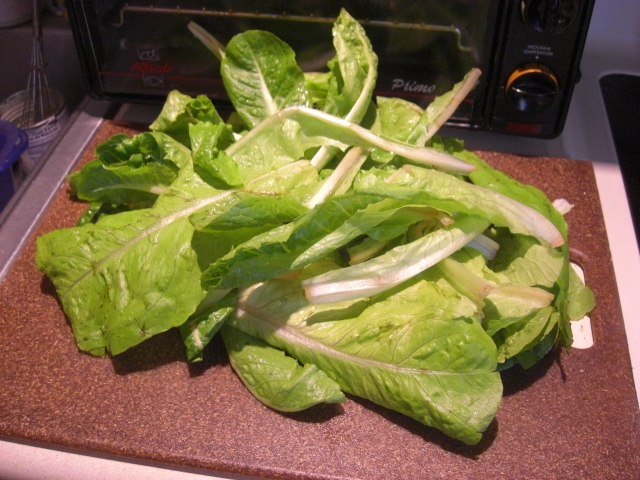 But now it’s time to get over ourselves and enjoy this very tasty Romaine fresh from the fields. I’m going to chop the lovage and oregano and toss it with pasta in something like this recipe. The chervil I’ve used on steamed veggies and salad. It also makes decent herbal tea. We’ll steam the peas one day soon with supper. This batch won’t make more than a serving or two, so you may want to make plans use them in a medley or casserole. Kohlrabi’s fun. You can slice it or dice it, steam it or sauté it. It’s got a cabbage-y flavor that goes well with meat. I spread this batch out on the table to dry before putting it away. I’m guessing we’ll sauté this spinach with raisins and walnuts towards the end of the week. The mushrooms are useful and nice to have around. Just pour hot water over some of them and let them sit for a few minutes. Then smell them. Sometimes these mushrooms produce a strong ammonia smell when they’re rehydrated. So rehydrate them off by themselves and not in your main pot. The cheese is herby and peppery. It’s what that pepper jack stuff wishes it was. 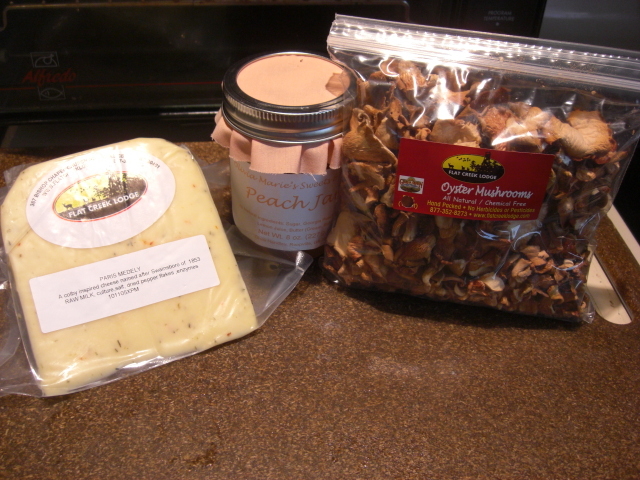 My problem is I really want to try this cheese when it’s at room temperature to get the full effect. However, when I want cheese, I usually want it NOW. So I’ve only had it chilled so far. Still, really good, though. The peach jam looks pretty and delicious and should go terrific with scones or biscuits. I’m proud of myself for steaming these veggies. I’ve never met a veggie I wouldn’t sauté in olive oil or butter, but steaming provides a nice, clean taste that lets all the veggie flavors come through. 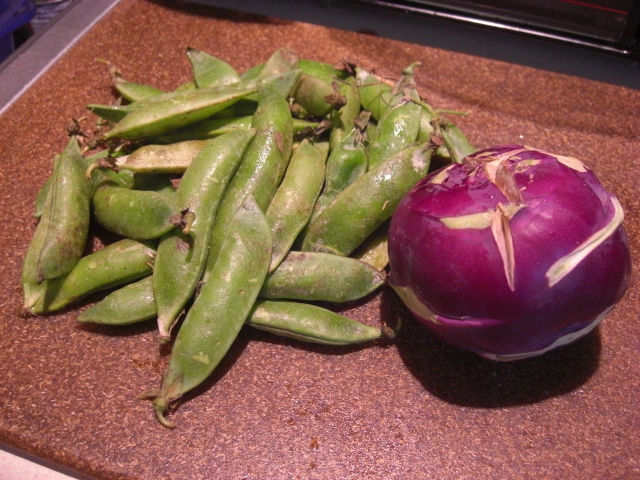 I sliced the kohlrabi on a mandoline so it would finish at the same time as the snow peas. 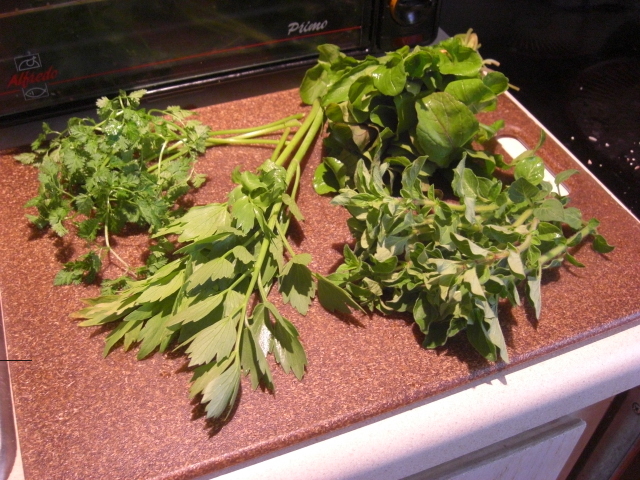 I tossed in a handful of lovage leaves, too, for fun. Chervil and just a little salt and pepper made it great. The sausage meatballs were made from local sausage and last week’s cilantro, plus non-local ingredients of bread crumbs, an egg, diced onion, and garlic. It’s a simple dish, really. Just mix everything together, shape into balls, and bake at 400 degrees for about 25 minutes. I topped them with a little barbecue sauce, and they tasted like tiny meatloaves. 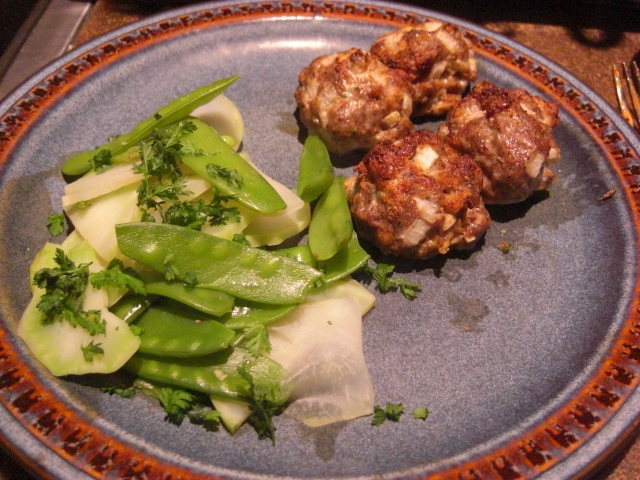 The meatball idea came from this recipe, but I didn’t want to deep-fry anything, so I combined it with this recipe for baked sausage meatballs.